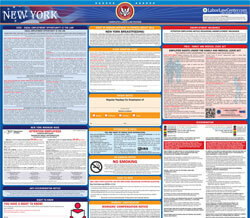 The Construction Industry Fair Play Act is an employee classification law poster by the New York Department Of Labor. This is a mandatory posting for all employers in New York, and businesses who fail to comply may be subject to fines or sanctions. This poster must be posted in a conspicuous place where all employees will see it. This poster describes the differences between an employee and an independent contractor as well as fines employers can be charged for misclassifying employees as independent contractors. It appears you don't have a PDF plugin for this browser. Please see the link below to download new-york-ia999.pdf. •  You have an independently established business . contractors or pay employees off  the  books. Employee  Rights : If you are an employee,  y ou are entitled to state and federal worker protections . •  A safe work environment . t he law. Retaliation subjects an employer to civil penalties, a private lawsuit or both. Unemployment Insur ance contributions required by New York State and Federal L aw. and  debarment from performing  public  work for up to one year. violations are taken seriously . Y ou can remain anonymous.